Variation in treatment and absence of any data or fixed protocol prompted my study on the utilization pattern of drugs in patients with CKD and to analyze the prescribing trends of antibiotics in this special group of patients. A prospective, cross-sectional observational study was conducted in the Department of Nephrology of a teaching hospital in October, 2014 to March, 2015. This study was approved by Institutional Ethics Committee. After obtaining written consent, patients diagnosed with CKD within the age group of 18-60 years were recruited in the study. Pregnant ladies, breastfeeding mothers, terminally ill-patients (patients with malignancy or having positive HIV, HCV, HBsAg) and patients planned for or postrenal transplant were excluded from this study. The patients were interviewed, and their prescriptions, clinical, and laboratory data were abstracted, reviewed, and recorded in a clinical data form. 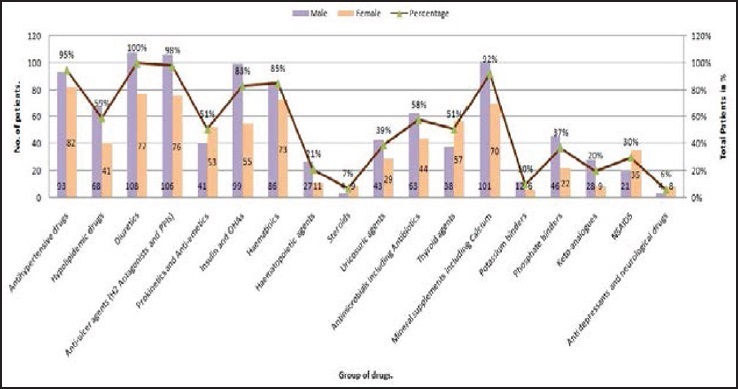 The data of the drug utilization of 185 patients were analyzed using GraphPad Prism version 5 (͹2015 GraphPad Software, Inc. USA). Results were expressed as mean ± standard deviation. Nonparametric values were expressed as a percentage. Among 185 CKD patients, 108 (58%) were males and 77 (42%) females [Figure 1]. The mean age of the study population was 45.81 ± 11.16. 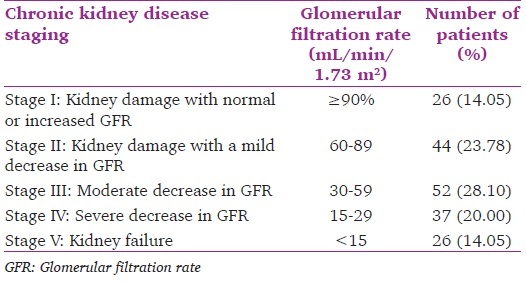 [Table 1] portrays the established five-stage classification of CKD and the distribution pattern of this study population to each stage. About 28% patients reported in Stage III CKD, followed by 24% in Stage II CKD. However, most of the patients among the 34% of the study population with CKD Stage IV and V were either admitted in a hospital or were on dialysis. All the patients had some or the other co-morbid illnesses. [Figure 2] depicts the distribution of most common associated diseases prevailing in CKD patients. One hundred and seventy five patients (95%) were hypertensives and 161 (87%) were diabetic. 159 (86%) patients were anemic, which included all 82 patients with CKD Stage IV and V having a mean Hb% of 7.24 ± 2.32. Ninety-seven (52%) CKD patients were diagnosed with hypothyroidism and dyslipidemia was associated with 83% of the patients. On reviewing the prescriptions, we found that 153 (83%) patients were advised more than 5 drugs at a time. [Figure 3] highlights the most prescribed groups of drugs in the management of CKD. Diuretics were advised in all 185 patients. One hundred and seventy-five patients were receiving anti-hypertensives among which angiotensin converting enzyme-inhibitors were extensively used. Usage of drugs such as clinidipine and prazosin individually or in combination was also marked to be 36%. One hundred and sixty-one (87%) patients were diagnosed to be diabetic among which 154 patients are on medical treatment. Insulin preferably short-acting insulin was advised in 117 (76%) patients and oral hypoglycemic agents in 37 patients. Sulfonylureas, biguanides, and gliptins were used individually or in combinations to manage diabetes in CKD Stage I to III patients and in others who were unwilling to take insulin. Hormone replacement therapy with thyroxine was used in 95 out of the 97 patients diagnosed with hypothyroidism. Anti-ulcer agents like H 2 blockers and proton pump inhibitors (PPIs) were rampantly used in 182 patients. Other commonly utilized drugs were mineral and calcium supplements, hematinics, prokinetics, and antibiotics. Keto-analogs were prescribed in those 37 CKD patients whose serum creatinine was in the range of 3-8 mg/dL and mostly among CKD Stage II to IV. CKD patients due to their co-morbidities and immuno-compromised status are susceptible to infections. 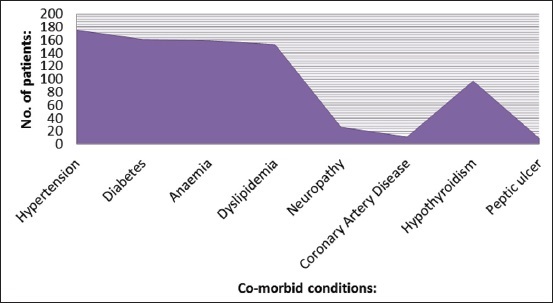 [Figure 4] illustrates the most common infectious diseases prevailing among CKD patients. One hundred and seven (58%) patients suffering from infections were either managed in outdoors or were admitted in hospital. It has been recorded that 28 patients were admitted with recurrent infections. Forty (37%) patients had respiratory tract infection, 36 (34%) had urinary tract infections, 11 patients had either gastrointestinal infections or eye and ear infection and 8 patients were diagnosed with tuberculosis. Twelve (11%) patients were having other types of infections. Two patients were diagnosed to have herpes, and 1 had a fungal infestation and other 9 patients presented either with pyrexia or leukocytosis predominantly neutrophilia or raised C-reactive protein or all. One patient presented with sepsis and 2 patients later developed sepsis even after rigorous treatment. [Figure 5] depicts the overall utilization pattern of antimicrobials in the management of infections in CKD patients. Antimicrobials especially antibiotics were prescribed directly or modified after assessing the culture and sensitivity reports in most patients. Parenteral antibiotics like piperacillin + tazobactam or meropenem were initiated in patients with high leukocyte count, sepsis or multiple co-morbid conditions. The dose of antibiotics administered in this study population in comparison with normal adult dose as shown in [Table 2]. Macrolides like azithromycin in normal adult doses, quinolones like ciprofloxacin and levofloxacin in renal adjusted doses were among the antibiotics most utilized. Twenty-one patients were prescribed 3 rd generation cephalosporins like ceftriaxone and cefoperazone. More than one antibiotic was utilized in 28 patients. Metronidazole in reduced doses was preferred to combat infections caused by Gram-negative and anaerobic micro-organisms. A single dose of 250 mg of amikacin through dialysis port was advised once a week for 4 weeks in patients with port site infection. Eight patients were diagnosed with tuberculosis. Six patients who were in the intensive phase were prescribed normal adult doses of isoniazid and rifampicin and reduced doses of pyrazinamide. Ethambutol was not used in any of the patients. The other 2 patients were on continuation phase and were receiving isoniazid and rifampicin. Antiviral namely acyclovir was utilized in the dose of 200 mg thrice daily. Fluconazole was the only antifungal that has been advised in 1 patient in the dose of 200 mg once daily. Polypharmacy or use of more than 5 or more drugs at a time is an unavoidable predicament faced while managing CKD patients due to the prevalence of co-existing illnesses. The average number of drugs utilized was 8.1 ± 3.2 which is at par with earlier studies. , All the drugs were prescribed in trade/brand names, and this practice should be discouraged. Of all drugs prescribed, the five most commonly used drugs were diuretics (mostly loop diuretics), anti-hypertensives (like calcium channel blockers, Angiotensin converting enzyme inhibitors and β-blockers), anti-ulcer agents, mineral supplements including calcium and hematinics. The diabetic patients were mostly on insulin therapy; however, oral hypoglycemic agents were successfully utilized among this study population. Sulfonylureas like glipizide and gliclazide were used in usual doses and biguanides (metformin) and gliptins (vildagliptins) were prescribed in reduced doses. There happens to be a mismatch between patients diagnosed with peptic ulcer and number of patients on anti-ulcer agents like H 2 blockers and PPIs. This may be either due to the prevention of stress ulcers or symptomatic treatment for dyspepsia. Hematinics were extensively used along with mineral supplements including calcium. However, hematopoietic agents like erythropoietin and darbepoetin were under-used due to low patient compliance and high cost. Keto-analogs were mostly prescribed in CKD Stages II to IV as recommended so as to decrease renal injury. Phosphate binders and potassium binders were also significantly used among this study population. CKD patients are at a high risk of infections and land up in recurrent hospital admissions. Reduced or absence of excretion by kidneys in renal failure causes an increase in the volume of distribution (V d ) and ultimately increases half-life (T½ ) of drug leading to accumulation of drug metabolites resulting in toxicity. Anti-tubercular therapy was initiated in 6 patients with normal adult doses of isoniazid and rifampicin and a renal adjusted dose of pyrazinamide. Use of ethambutol in CKD patients is not recommended and so not used. Management of renal compromised patients possesses a challenge to physicians. This study illustrated the present day scenario of CKD patients in India and the prescribing trends of physicians in managing these patients with co-morbidities and complications. It will provide an outline for management strategies and will be influential in healthcare decision making. Drug-induced nephrotoxicity initiates progression of renal failure leading to morbidity and mortality. Appropriate dosing of drugs including antibiotics is vital as it can prevent adverse effects, toxicities and will lead to better clinical consequences. Levey AS, Coresh J. Chronic kidney disease. Lancet 2012; 379:165-80. Manley HJ, Drayer DK, Muther RS. Medication-related problem type and appearance rate in ambulatory hemodialysis patients. BMC Nephrol 2003;4:10. Kappel J, Calissi P. Nephrology: 3. Safe drug prescribing for patients with renal insufficiency. CMAJ 2002;166:473-7. World Health Organization: Burden of Disease Project. Available from: http://www3.who.int/whosis/menu.cfm [Last accessed on 2014 Nov]. Roberts JA, Lipman J. Pharmacokinetic issues for antibiotics in the critically ill patient. Crit Care Med 2009;37:840-51. Wanigasuriya KP, Peiris-John RJ, Wickremasinghe R, Hittarage A. Chronic renal failure in North Central Province of Sri Lanka: An environmentally induced disease. Trans R Soc Trop Med Hyg 2007;101:1013-7. Le Grand A, Hogerzeil HV, Haaijer-Ruskamp FM. Intervention research in rational use of drugs: A review. Health Policy Plan 1999;14:89-102. Levey AS, Coresh J, Balk E, Kausz AT, Levin A, Steffes MW, et al. National Kidney Foundation practice guidelines for chronic kidney disease: Evaluation, classification, and stratification. Ann Intern Med 2003;139:137-47. Long CL, Raebel MA, Price DW, Magid DJ. Compliance with dosing guidelines in patients with chronic kidney disease. Ann Pharmacother 2004;38:853-8. Manley HJ, Cannella CA, Bailie GR, St Peter WL. Medication-related problems in ambulatory hemodialysis patients: A pooled analysis. Am J Kidney Dis 2005;46:669-80. Wazny L, Moist L. Chronic kidney disease. In: Gray J, editor. E-Therapeutics +. Ottawa, ON: Canadian Pharmacists Association; c2012. Available from: http://www.e-therapeutics.ca. [Last cited on 2012 Apr 20]. Manley HJ, Garvin CG, Drayer DK, Reid GM, Bender WL, Neufeld TK, et al. Medication prescribing patterns in ambulatory haemodialysis patients: Comparisons of USRDS to a large not-for-profit dialysis provider. Nephrol Dial Transplant 2004;19:1842-8. USRDS 1998 Annual Data Report. Bethesda, National Institutes of Health, National Institutes of Diabetes and Digestive and Kidney Disease; 1998. Khan SS, Kazmi WH, Abichandani R, Tighiouart H, Pereira BJ, Kausz AT. Health care utilization among patients with chronic kidney disease. Kidney Int 2002;62:229-36. Bailie GR, Eisele G, Liu L, Roys E, Kiser M, Finkelstein F, et al. Patterns of medication use in the RRI-CKD study: Focus on medications with cardiovascular effects. Nephrol Dial Transplant 2005;20:1110-5. McCormack J, Carleton B, Calissi P. Dosage adjustment in renal impairment. In: Gray J, editor. E-Therapeutics+. Ottawa, ON: Canadian Pharmacists Association; c2012. Available from: http://www.e-therapeutics.ca. [Last cited on 2012 Apr 20]. Leung E, Weil DE, Raviglione M, Nakatani H, World Health Organization World Health Day Antimicrobial Resistance Technical Working Group. The WHO policy package to combat antimicrobial resistance. Bull World Health Organ 2011;89: 390-2.